We have all been there. You spotted the perfect outfit on Pinterest, a stranger on the street, or a fellow blogger, but none of your creative Google searching has uncovered the coveted item. Or worse yet, you do find it & it is sold out! Enter The Hunt. Your new shopping best friend. In this online world we live in it is easy to get sucked into the internets searching & searching for the dress of your dreams that you spotted on so-and-so, but why not sign up for The Hunt & let the Internet masses do the searching for you!? 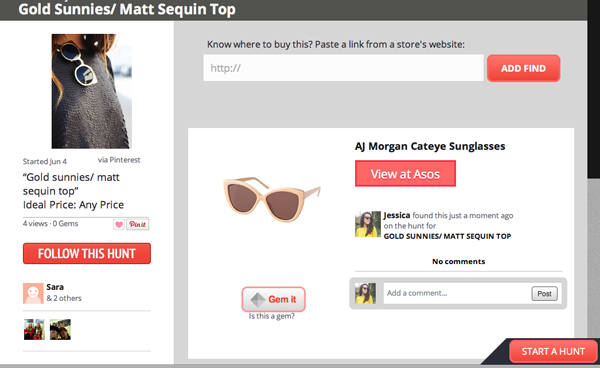 I just helped someone find these chic gold sunnies that they had spotted on Sincerely Jules. Cause that's what friends do. Ok, so now I'm wanting to cash in on that good sunglass finding karma! Come help me solve my Hunt for the perfect Summer Cover up! Will you be signing up for The Hunt? What is on your wish list? If you start a Hunt link it up here so we can all help!